A midweek Premier League mauling for Jose Mourinho and Manchester United, who fell behind after only 11 seconds at Wembley and never found any rhythm against an inspired Tottenham. Mauricio Pochettino’s men flew out of the blocks with Christian Eriksen’s early strike, and dominated from first to last against a United team for whom Nemanja Matic and Paul Pogba endured a torrid evening in midfield. The scoring was completed when Phil Jones turned a Kieran Trippier cross into his own net just before the half-hour. Tottenham deployed a 4-2-3-1 formation in attack and a 4-4-1-1 in defence. Mauricio Pochettino opted to start with Son Heung-min, Dele Alli and Christian Eriksen in an attacking three behind Harry Kane. The Tottenham front line worked to make life difficult for Manchester United as they tried to play out from defence.  The three attacking midfielders marked the full-backs and one of the centre-backs, leaving Kane to hound the other centre-half and force David de Gea to go long when in possession. Eric Dier and Mousa Dembele maintained a balanced defensive block in central midfield, but also worked to press the man in possession – most notably Nemanja Matic, who was constantly prevented from spraying the ball wide. Alli and Kane enjoyed total freedom to move around in attack, occupying space in between the lines. Hugo Lloris alternated direct balls into Kane with short passes to his full-backs Ben Davies and Kieran Trippier, but Spurs were not threatened by the United pressure in their initial passing game – and Dier in particular often managed to pick out his more attacking teammates in space. 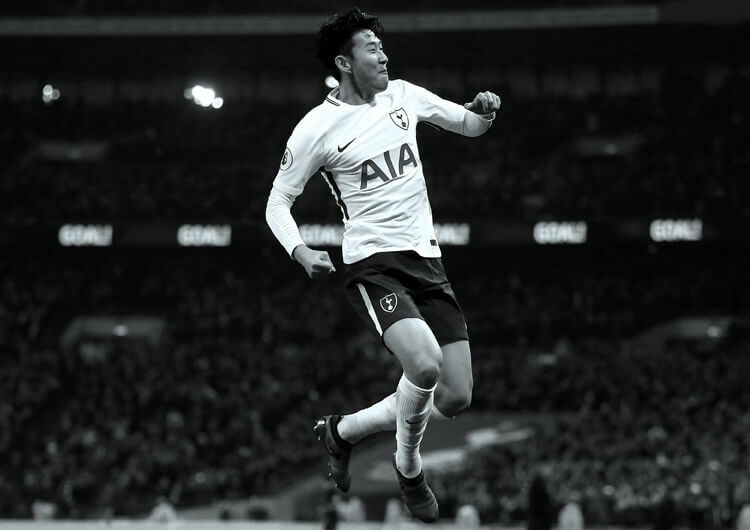 Spurs liked to vary their tempo, switching between a slow rhythm when they could not find any gaps and swift passing through the thirds when there was space to supply Son or Eriksen in wide positions. Both were quick to support Alli in central positions, too, thus outnumbering an exposed Matic. 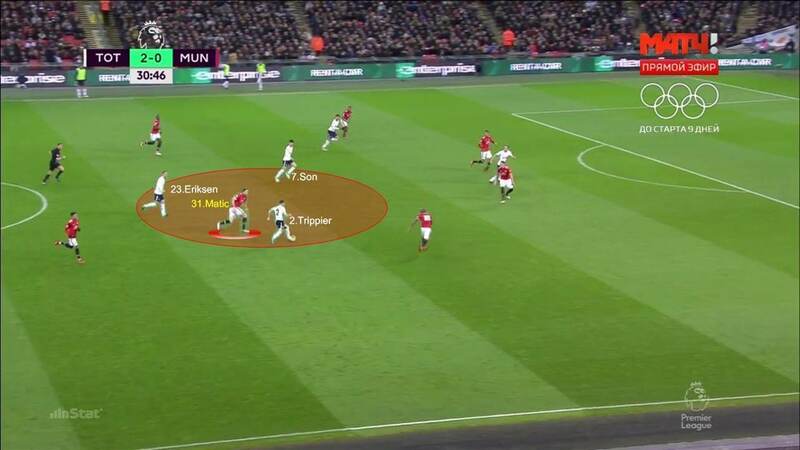 The home side were keen to launch counter-attacks as soon as they won the ball, trying to take advantage of possible gaps in United’s defensive structure. Alli, Son, Eriksen and Kane managed to break through the lines of pressure with incisive runs and breakaways, looking for gaps between and in behind the last defenders. Tottenham deployed a 4-2-3-1 formation in attack and a 4-4-1-1 in defence, with Son Heung-min and Christian Eriksen dropping back into a midfield four. They defended deep and showed balance between their defence and midfield. 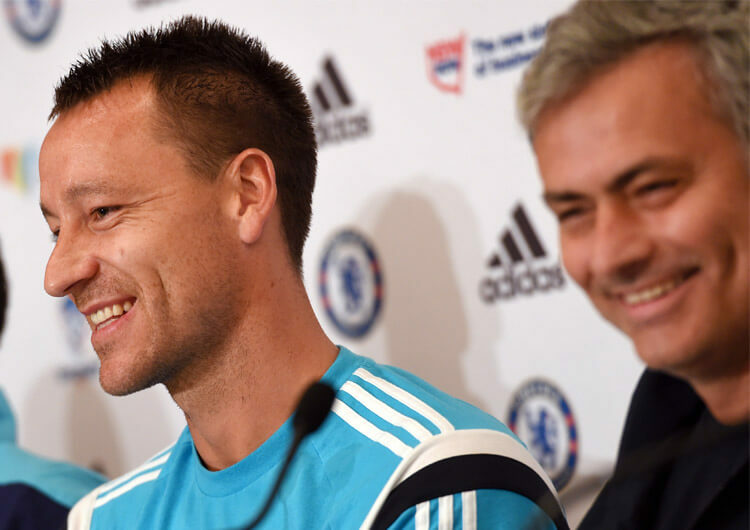 Mauricio Pochettino established a defensive unit that dried up the passing options for Nemanja Matic. Here the midfielder is channelled into the centre, where the Tottenham block cuts off any potential passes forward. Tottenham surprised United from the kick-off. Harry Kane flicks on a direct pass from the back to find Dele Alli in the area. Christian Eriksen runs in behind the last line of defence and beats David de Gea only 11 seconds into the game. 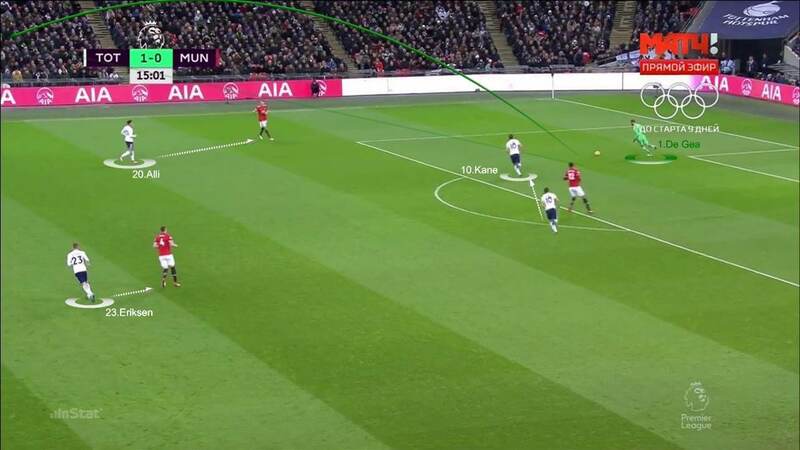 The Spurs forwards pressed the United back four effectively, blocking any short balls to the man out wide and repeatedly forcing De Gea to go long. Spurs reorganised quickly and effectively in defensive transition. Defenders delay the player in possession, while the speed of their tracking back helps them win the ball back. 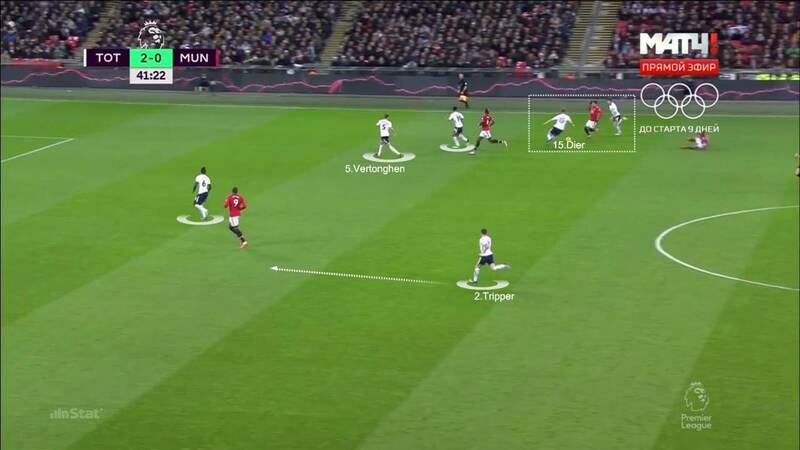 Manchester United were overrun both in defence and midfield, and never managed to address the dominance of the Spurs attacking midfielders against an exposed Nemanja Matic. 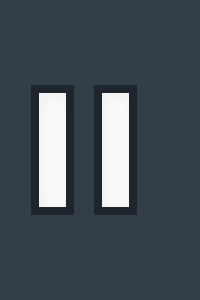 This image shows how Alli, Eriksen and Son worked to outnumber him. 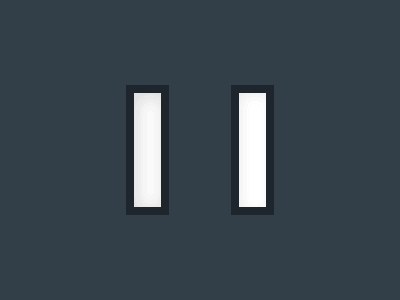 The last line of United defenders often lost their shape. Here, Ashley Young is too close to his neighbouring centre-back, affording Kieran Trippier time and space to deliver a cross. Harry Kane gets beyond Chris Smalling, which distracts Phil Jones and eventually leads to his poor touch for the own goal. 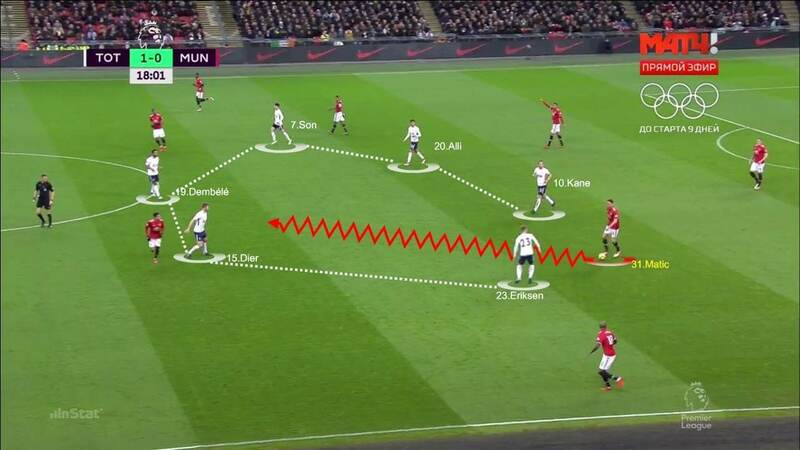 United left a lot of space in their defensive transition, which the Spurs attackers were able to exploit. 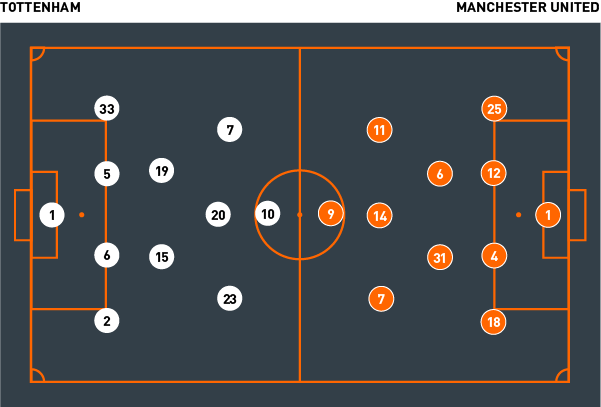 The advanced positions of Antonio Valencia and Young means they are unable to provide adequate defensive support for their centre-backs. United failed to reorganise properly in their defensive transition. Here, Matic is overwhelmed by the number of opposition attackers around him, allowing Spurs an easy route to the opposition box. United failed to pose any real threat to the Tottenham back four. Here, Young is forced to look for Jesse Lingard and Romelu Lukaku from a deep crossing position. Spurs were always well organised and occupied the right spaces to deal with such delivery. Manchester United lined up in a 4-2-3-1 formation, dropping back to 4-1-4-1 in defence, with Nemanja Matic sweeping behind a midfield line of Anthony Martial, Paul Pogba, Jesse Lingard and Alexis Sanchez. Romelu Lukaku and Lingard pressed the Tottenham defence in possession, but too often allowed them to exchange short passes in their own half. 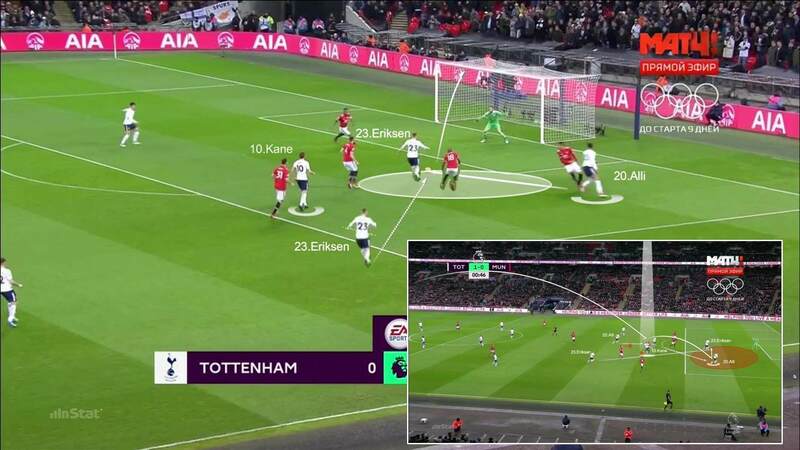 Matic repeatedly found himself outnumbered by Alli, Eriksen and Son. The United defenders were too slow to the tackle and their back four was overwhelmed by the hosts. 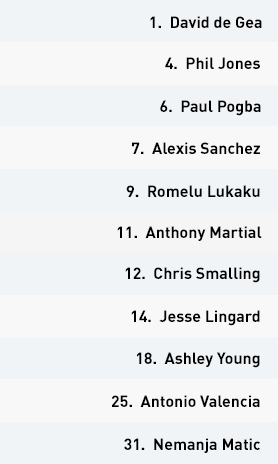 Chris Smalling and Phil Jones made individual errors and were too often out of position – with Harry Kane free to roam, they lacked a fixed player to mark and struggled to deal with that. 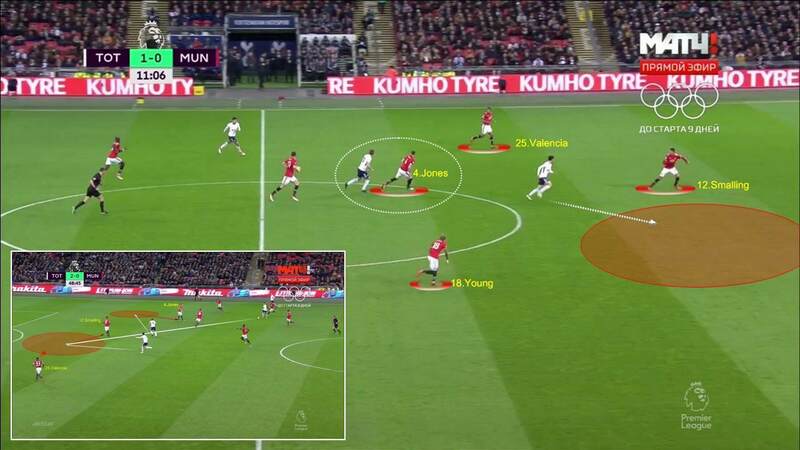 Ashley Young gave Kieran Trippier too much space on the right flank, allowing him to send dangerous deliveries into the penalty area, as evidenced by the build-up to the second goal. United struggled to reorganise after losing the ball. The Spurs attackers bypassed their threadbare first line of pressure and left an exposed Matic unable to provide defensive cover for the back four. 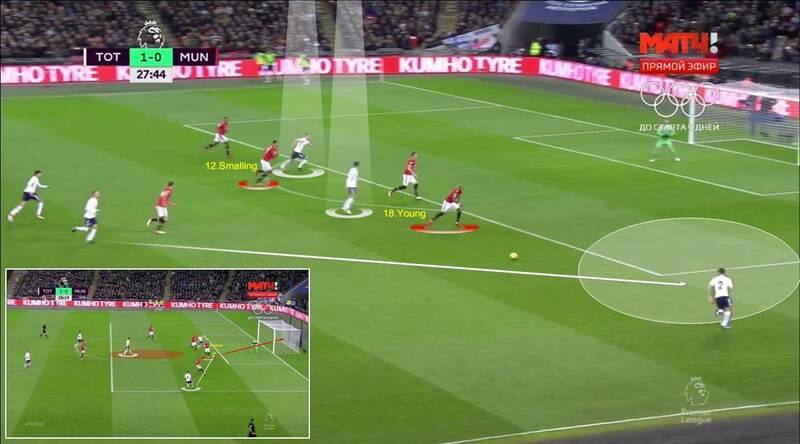 Young was often out of position, meaning that they were vulnerable to counter-attacks down his wing. Mourinho went direct in attack, but United could not connect with enough of their passes to do Spurs any real damage. De Gea was forced into looking for Lukaku in the opposition half, but the Belgian striker was unable to dominate Davinson Sanchez or Jan Vertonghen in the air and failed to hold the ball up effectively. Lingard’s runs from midfield posed the greatest threat, with Pogba unable to find space and Alexis Sanchez often more preoccupied with defence rather than attack. 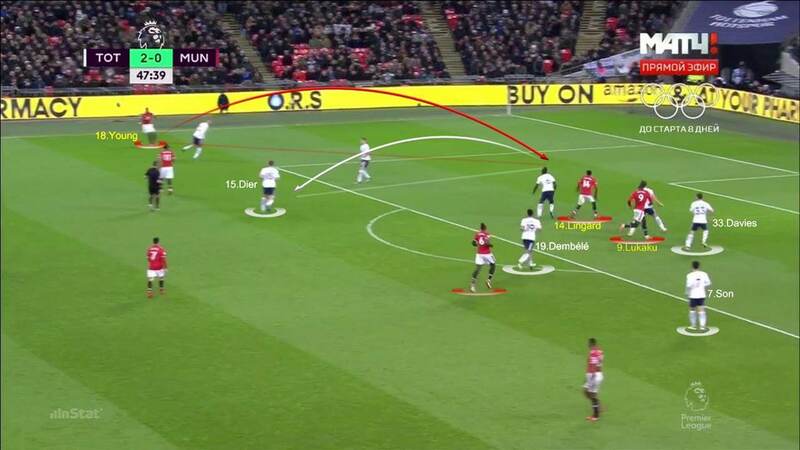 Neither Antonio Valencia nor Young were able to get forward into crossing positions, leaving Lukaku an isolated figure lacking service in the Tottenham penalty area. Tottenham enjoyed total control of the match. 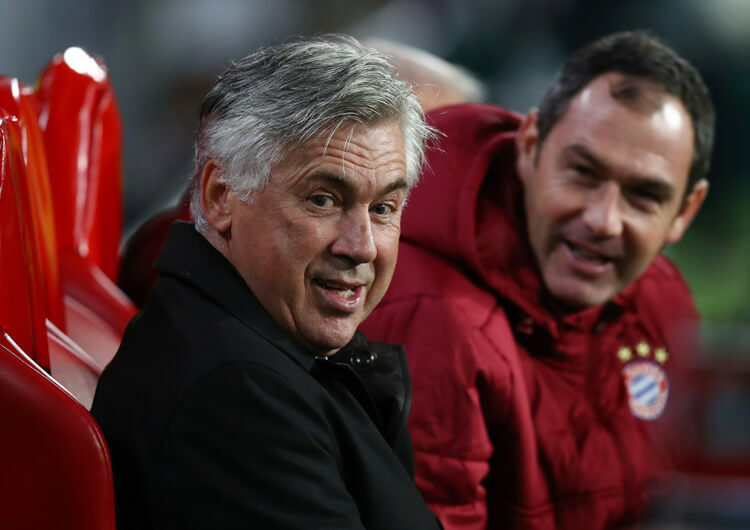 They dominated possession and dictated the tempo, moving up the pitch at a measured pace and mastering both their attacking and defensive positioning. The hosts were well organised inside their own half. 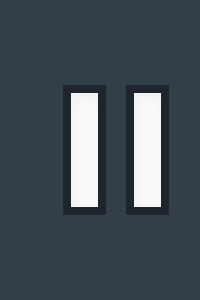 Mauricio Pochettino’s side formed two structures after losing the ball: the first pressed the player in possession, and the second repositioned in their own half. This was effective at neutralising the counter-attack. Spurs repeatedly found numerical superiority in the space in and around the Manchester United back four. Dele Alli, Christian Eriksen and Son Heung-min outnumbered Nemanja Matic throughout. Manchested United left gaps on the edge of their own penalty area. 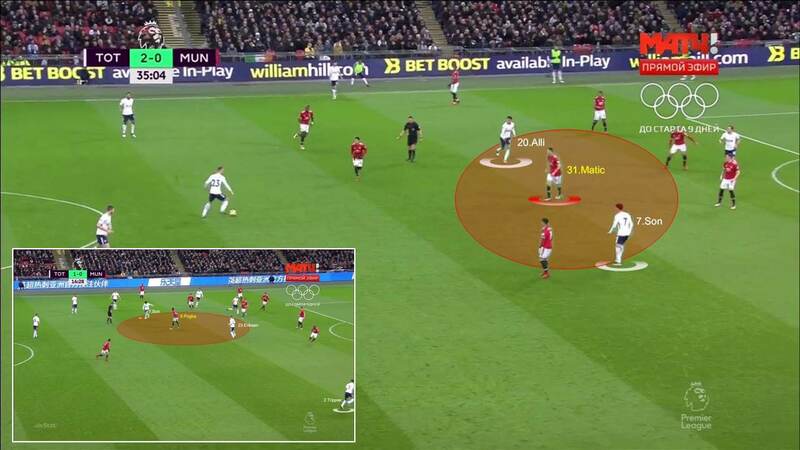 Centre-backs Chris Smalling and Phil Jones struggled to deal with the movement of Harry Kane, as it left them no one obvious to mark, but they still allowed considerable space in behind. The visitors could not keep the ball well enough to cause danger in the opposition half. Starved of options by an excellent Tottenham midfield press, Matic failed to find the right passes to supply his teammates in good attacking positions.